I’ve been talking a lot about Facebook’s Promoted Posts feature recently, mostly because I think it’s a fascinating new advertising unit. Being so enamored with them has led me to make a few discoveries I thought I would share with our readers. There have been a few recent reports about Facebook’s user base and the quality of the clicks that Facebook Ads have been getting. 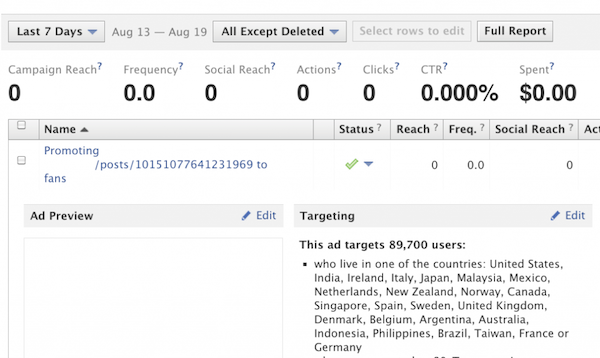 An important message has arisen from these discoveries – target carefully when using Facebook Ads. Promoted posts are no different – when you start them, they automatically target a wide variety of demographics that you might not be interested in. Are they targeting the people attached to your page? You bet. But some of those followers are more valuable than others. If you’re promoting a post about an upcoming in-store promotion, for instance, you probably don’t need to waste ad spend on fans on the other side of the world. How can you change this? Simple, just navigate to your Ads Manager on the left hand menu, expand the promoted post, and click the ‘Edit’ button next to Targeting. That will open up a new tab with all of your ads information. Scroll down to the ‘Location’ box under ‘Choose Your Audience’ and remove any unnecessarily targeted countries. Yup, that’s right. When you go into your Ads Manager after promoting a post, you’ll notice that there are two ad units running instead of just one. When you take out a promoted post, Facebook creates both a Page Post Ad and a Sponsored Story. These are both targeted for users news feeds. The Sponsored Story is set to target the news feeds of users who have a friend that interacted with the post that you are promoting. Make sure you make adjustments to both of these ads whenever you change anything. Facebook likes to give you predetermined spends when you promote a post, usually in increments of $5 or so. For larger pages, they can go way, way up – I’ve seen $500 before, and I imagine it can get even bigger as you approach the 100k fan limit. If you don’t see a Reach/Spend combo to your liking, or a post is going very well and you want to juice it, you can adjust your spend directly in the Ads Manager. Just expand the Campaign (Not the individual Ad) that you want to increase and click the pencil icon next to the ‘Budget’ and ‘End Date’ boxes to make changes. I have run a ton of these ads and haven’t seen them accurately hit their mark on Reach yet. Better still, they vary for the same unit on a day-to-day basis. I’ve started a promotion, decided to add more the next day, and then seen both a wild increase in price and a huge swing in predicted reach for the post. Start your promoted post with what you want to spend, not how many people you want to reach, and adjust the spend as you go to achieve either goal. They clearly are still working on the kinks in their algorithm. And that’s all I’ve got. I’m still very into the idea of promoted posts, and I think they’re an effective ad unit. Don’t walk away from this with any other impression. That being said, make sure you follow these steps to get the most bang for your buck. Otherwise, they might leave a sour taste in your mouth. Have you tried Promoted Posts yet? What kinds of results have you gotten?